When applying these additives what kind of Spray Gun are you using? How much pearl do I have to add per gallon of Plasti Dip Spray? - We recommend mixing in 50 grams per gallon for best results, but up to 75 grams can be added. Do you add the Pearl Pigment/Micro Flake into colored Plasti Dip or Clear? - In order to gain best results we advise to mix the pearl directly into either clear Plasti Dip Spray, or a 50/50 mix of Plasti Dip Spray and Glossifier. Nevertheless, you can surely add pearls directly into colored Plasti Dip Spray for one-of-a-kind colors and special effects. Play around to see what you like best! Do you use Thinned or Un-thinned Plasti Dip when adding pearls? How much Micro flake is needed per gallon? - We advise to mix 25 grams per gallon in order to have best results. You can use up to 50 grams per gallon but the surface will have a slightly sandy texture. 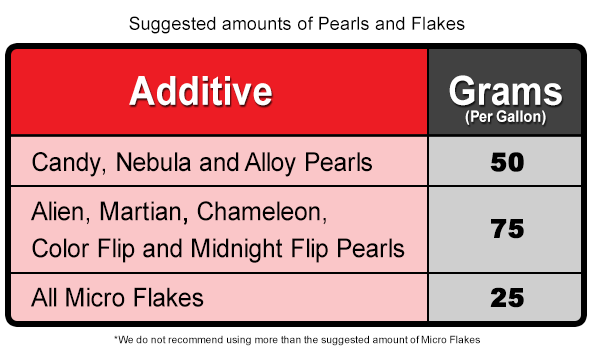 May I use Micro Flake like Pearl in order to make custom colors? - Yes you can, but if you add the required 50 grams per gallon you may have a Sandy textured surface when finished. Do I need to apply a base coat first? - Yes, base coats are necessary for all Dip Pearls. For many cases we use a Matte Black Plasti Dip Spray base coat, however, you can also use a Color Matching base coat if desired (Blue Plasti Dip Spray as a base for World Rally Blue Pearls for instance). Experimenting with various base coats and top coats is encouraged - we are creating new and exciting combinations all the time!